We knew it would be a long day. The musicians in New Duke arrived at the Fairfield University studio where I teach my classes. The charts were laid out on stands that the eight musicians would sight-read and then perform a few hours later. Steve Moran, Rick Sadlon, John Fumasoli, Jamie Finegan, Dave Childs, Darryl Tookes and Don Mulvaney are pros and this is not unusual for players of this caliber. I suggested that the band needn’t rehearse our older material when suddenly vocalist Darryl Tookes cleared his throat loudly into the microphone. Everyone laughed, reflective of the humor and camaraderie of our jazz-rock band. Our new tunes showed the band’s musical range from Billy Strayhorn’s Lotus Blossom mixed with Crosby, Stills and Nashs’ Guinnevere to Duke Ellington in a mash-up with James Brown. For this session I composed Twenty Seven, a tale of loss at this age set to a funk beat, Freedom Is, a Junior Walker influenced soul tune, and Legend of Robert Johnson, a second-line inspired homage to an American mythical blues figure. Writing for New Duke is inspiring and a great joy for me. New Duke then headed off to Guilford for a business meeting at the Stonehouse restaurant. The band discussed future plans at dinner and then departed to the Poetry by the Sea seminar in Madison, CT. where we performed that night. We ran through our set with great enthusiasm despite having a small crowd in attendance. Packing up our equipment, it was an end to a long and productive day of music. We headed off our separate ways, into the night. All was quiet except for the crickets. New Duke and Musical Mash-ups! New Duke plays future music from a musical past. Jazz-rock was a musical style that came to prominence in the late nineteen-sixties. In an era of fusion and syncretism, it signaled a musical marriage of sophisticated jazz harmony and improvisation combining tight horn sections with the electric energy of a rock and funk rhythm section. Landmark vinyl from Blood, Sweat and Tears, Tower of Power, Electric Flag and (early) Chicago brought new design and vision, bringing the past color of jazz to a new generation. Time faded the style and by the mid-70’s the thrill was gone. 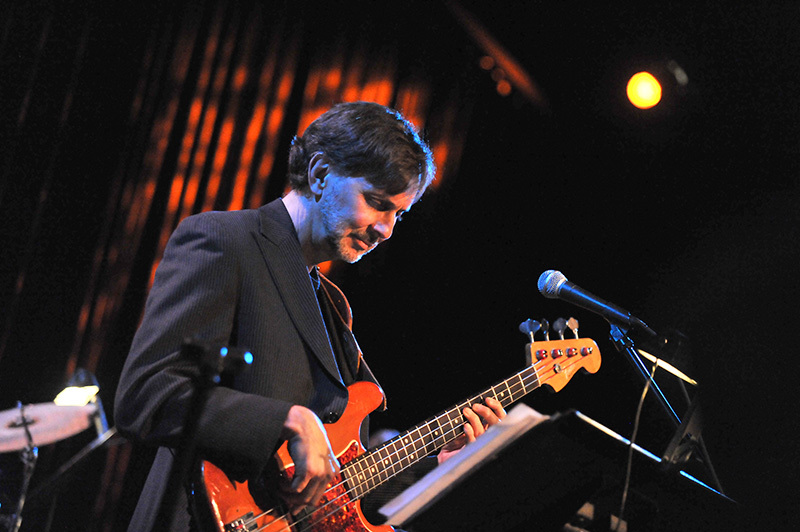 Bassist, composer and arranger Brian Torff was inspired by this sound. “I was born in Chicago and it was the 3 B’s, The Beatles, James Brown and BS&T that really inspired me. I always associated great music- jazz, rock, or soul, with punchy horn sections,” said Torff. He moved on to a performing career working with George Shearing, Erroll Garner, Mary Lou Williams, Stephane Grappelli, Cleo Laine and Frank Sinatra. He has been a professor of music at Fairfield University in Connecticut since 1993. That is where his band, New Duke, began. 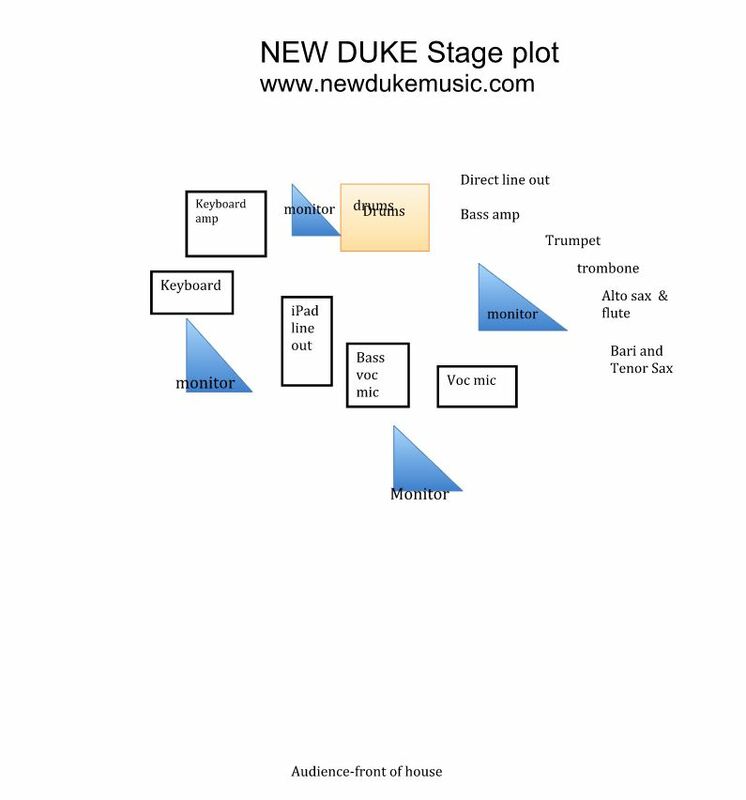 (www.newdukemusic.com). “My associate, Dr. Laura Nash received a 2011 National Endowment for the Humanities grant to present a workshop on the life and work of Duke Ellington,” said Torff, “and we wanted to put together a band that would do new things with his music.” The concept grew into a mash-up where Torff composed and arranged music that mixed Ellington with Jimi Hendrix, the Doors, James Brown, Stevie Wonder, Cream, and Pharrell Williams. “It is a mash-up concept with jazz-rock roots but with a unique twist,” said Torff. New Duke performs original tunes such as the “Mandela Freedom Suite”, “Mississippi Saxophone” and “Last Record Man.” The band consists of Darryl Tookes, vocals, Jamie Finegan, trumpet, Rick Sadlon, alto sax and flute, Steve Moran, tenor and baritone sax, John Fumasoli, trombone, Dave Childs, keyboards, Torff, bass, vocals, harmonica, and musical director, and Don Mulvaney, drums. They have performed in jazz festivals, concerts, conferences and in school-workshops. New Duke recently released two videos that demonstrate this diverse concept. Rockin’ in Rhythm (youtube.com/watch?v=IZ6VJVcG-4E) fuses Ellington’s classic tune with 50’s rock lyrics from Chuck Berry, Big Joe Turner, Elvis Presley and a dash of Louis Prima. The Torff original, Workin’ On a Bassline (youtube.com/watch?v=-OJYQI4bwQ0) is a rocking soul-funk tune that tells a story of his mentor, jazz bassist Milt Hinton and his ascent from Mississippi to fame. On the wall in our den, my wife Sarah hung two images in separate frames. The first is an album cover from the early 60’s of Miles Davis’ landmark recording Sketches of Spain. It belonged to my father Selwyn, and I heard it often when I was seven years old. The mysterious sounds of that music that came from his Fisher Hi-Fi speakers were mesmerizing to me. I was transfixed by the colors in the music of Miles Davis and the arranger Gil Evans. The second image on our wall is a poster from the 60th Newport Jazz Festival where I had the honor of performing in August of 2014. The two images bounce off of each other. That may best explain the musical approach of New Duke. Instead of separating styles we combine them by letting Jimi Hendrix speak to Duke Ellington and James Brown, Stevie Wonder to Billy Strayhorn, Cream and the Doors intersect with big band jazz. Like the images on the wall, these sounds are in dialog with one another, transcending time, genre, and category. People love categories and that is fine in the grocery store where we can separate the various food groups, but art is a place that disintegrates boundaries. If we hit our mark we achieve, as Ellington gracefully put it, a sound that is beyond category. Things changed in the modern era and Armstrong began to look archaic to a younger generation immersed in the struggle for civil rights. Understandably, they did an about face; cool was in. No longer did most great jazz musicians show their feelings on the bandstand. Enthusiasm took a backseat to a funereal demeanor that provided protection from a public they did not always trust. Times change and soon rhythm and blues (later dubbed ‘Rock and Roll’) stole the thunder from jazz. It gave the audience a driving beat music that connected to the inner rhythms of the body, and it put on a great show. Little Richard and Chuck Berry became the icons of a musical generation that welcomed the audience into a new community. When I first came to New York City in the mid 70’s, I never understood why so many jazz musicians were so grim on the bandstand. I loved the music so much that I couldn’t help but smile broadly when the music started; performing was a joy. Yet that wasn’t cool. If you love it why not show it? My tours with the jazz violinist Stephane Grappelli taught me one thing, love every note and so will the audience. We need to combine artistry with an engaging performance that invites the audience to come along with the musicians. It is basic human communication, call and response. When I arrange and compose music for New Duke, I have both a musical and an entertainment effect that I hope to achieve. I expect the band’s wonderful musicians to deliver not just the notes but the feeling behind the music, and we should have a great time doing it. Every performance must be a celebration. I love Miles Davis and the modern jazz sounds and will always find inspiration in a multitude of musical approaches. Call me naïve and Midwest, but I believe that playing music should be an act of many emotions and the first one is joy. One night I was backstage with the pianist Erroll Garner in the kitchen of Mister Kelly’s, a famous supper club back in the day. He turned to me right before we were to go on before the last set of the night and with that wry smile said, “I try to make every night feel like a party.” I never forgot it. Maybe Louis Armstrong was right after all. I had the honor of playing the Newport Jazz Festival for the first time this past August of 2014. The festival turned sixty this year. It is the first and oldest of all the American jazz festivals and arguably the most prestigious. I was performing with the Django Reinhardt All-Stars, an NPR field recording link can be found at http://www.npr.org/event/music/342167061/the-fastest-fingers-at-the-festival-for-django-reinhardt. I was able to hear some great bands before our Sunday afternoon final performance of the festival. Everyone was top level as you would expect, but I noticed something that has stayed with me. I found that quite a few of the groups were playing above the audience, not to the audience. There seemed to be a lack of communication. As one person said to me, “They’re not playing festival music.” I think he was right. There was a dedicated audience who had braved a rainy weekend and wanted to not only hear great jazz, they wanted to feel good, maybe even uplifted. This has been a problem in jazz since the bop era-the imbalance of being a pandering entertainer as opposed to being a serious artist who demands the audience give quiet respect. They are two extremes that get caught in a futile debate about what jazz really is. It is an argument that no one can win. The good news is there is a middle-ground of new bands that play high caliber music yet make sure they connect with the audience. This communication is clearly important in their musical approach and conception. If jazz is to not only survive but thrive we are going to need to think about this. This may explain my approach to New Duke. We play Duke Ellington’s music but fearlessly perform mashups with Jimi Hendrix, The Doors, James Brown, The Cream, ska, reggae, and whatever else I can throw in the gumbo. I see no reason not to do this, it is the music of my early years as a young musician and fan. The possibilities are endless. As I walked out of the muddy fields of Fort Adams Park in Newport, I felt the presence of the past giants who had once played there. They followed their own vision, now we must follow ours. New Duke was recently featured in the Branford Eagle newspaper after their performance at the Branford Jazz Festival on July 3, 2014. He plucked his bass string. Cleo Laine’s voice began to accompany him. It was 1974 and Carnegie Hall heard jazz double-bassist and composer Brian Torff for the first time—and he was only 20. Forty years later, Torff is still playing—most recently on the Branford Green. Today, Torff is a music program director at Fairfield University, Fairfield Arts Council’s 2008 artist of the year, and the Branford Jazz on the Green series’ latest performer. Click on the video to hear him play Duke Ellington’s “Come Sunday” last Thursday night on the Green. Unlike at past Branford jazz performances, Torff and New Duke’s performance was a more modern labor as Ellington’s main pieces were from the 1930s, Branford Jazz on the Green emcee, Bill Keane said. When he is not serving as emcee, Keane is the Rev. Bill Keane, senior minister of the First Baptist Church on the Green. Torff performed alongside Jamie Finegan on the trumpet, Rick Sadlon on the alto saxophone, clarinet, and flute, Steve Moran on the clarinet and soprano, tenor, and baritone saxophone, Dave Childs on the piano, Don Mulvaney on the drums, and Darryl Tookes as the vocals. Torff himself performed with the acoustic and electric bass as well as the harmonica.